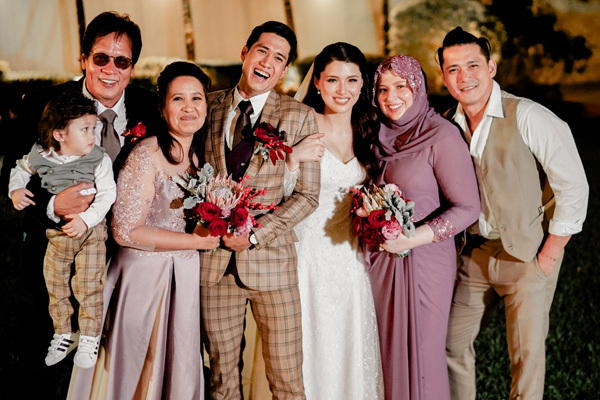 Filipino celebrity couple Aljur Abrenica and Kylie Padilla finally tied the knot last December! Their big day took place in the beautiful Villa Milagros, and the styling by Gideon Hermosa totally transformed the place into a flower-filled sanctuary, with just a touch of avant-garde to it. The dark color scheme of black, red, and gold, contrasted with the fun and vibrant personalities of this young couple, and brought a modern touch to the wedding’s overall feel. Kylie wore a gown that was designed by Mak Tumang, which she matched with a pair of red Jefferson Si heels. Keep an eye out for the unique details too, like the poem calligraphed on the aisle, and the stunning six-tiered wedding cake. See this celebration of love through the photos taken by ProudRad! « Check Out these Sneak Peek Shots of Iza Calzado and Ben Wintle’s Wedding in Palawan!